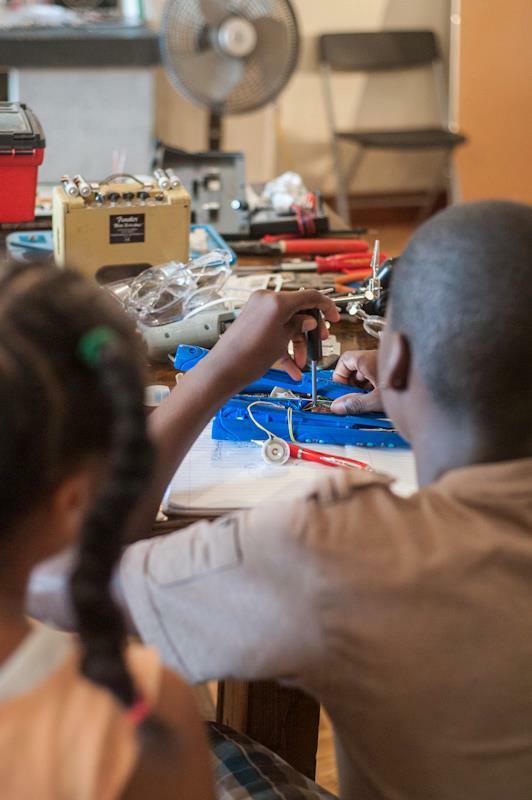 Make Nashville is a local maker’s group that recently launched an East Nashville makerspace. Each month, they host a public meetup centered around a particular topic. This month, the topic is circuit-bending! What the heck is circuit-bending? It’s the art of re-purposing old electronic toys and transforming them into musical and visual instruments. Here’s the Wikipedia entry. If you dabble in bending, bring your creations to show off. If not, come learn about the practice. Tyler Blankenship will be on hand to talk about the 2017 Circuit Benders’ Ball and Modular Art Pods @ Queen Ave. The FREE meeting happens August 16 from 6:30 p.m. to 8 p.m. at the makerspace, which is located at 947 Woodland St, Nashville, TN. It’s also a great opportunity to tour the space and inquire about membership. More info at the Meetup.com event page. Intro to Circuit Bending class at the 2012 Circuit Benders’ Ball. Photo by Angelina Castillo. Jill Burton and Misha Feigin. Image courtesy of FMRL. There are few opportunities in Nashville to see free-improvising movement artists or Russian guitar virtuosos. To see them perform as a duet? Well, that just never happens. Except tonight at Portland Brew. 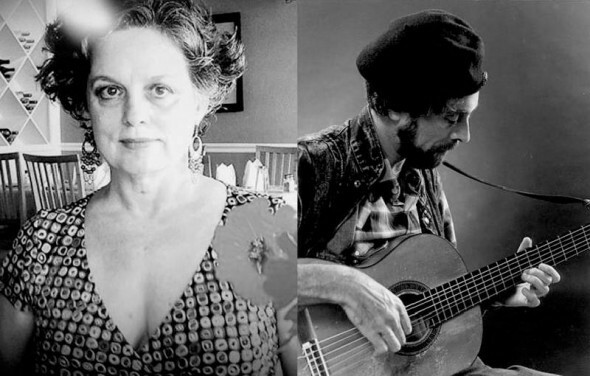 FMRL Arts presents the accomplished performance artist, extended vocalist, and energy worker Jill Burton and Moscow guitarist and free jazz/folk artist Misha Feigin. The Cherry Blossoms’ John Allingham will also perform. Watch the videos below to see what you’re in for. More info on the Facebook event page. Saturday, May 23rd, 2015, 9 p.m. Noise Furniture, Saturday at the 2014 CBB. Photo by @AkbarsBlackEyes. We have some amazing panels and presentations lined up for today. We want as many people as possible to check them out, so we’re making them free and open to the public. You do not need a pass or a ticket to attend today’s panels/presentations. Just head over to Fort Houston and ask the person at the front counter where to go. At 11 a.m. we have Chris Richards hooking the audience up to a giant musical instrument. At noon Mike Hester will show you how to turn digital images into music. At 1 p.m. we the panel I’m most looking forward to: Structural Bias in Show Booking. Local musicians, artists, and show bookers Kathryn Edwards, Kale Edmiston, Paul Horton, Virginia Griswold, David Wright Lagrone and the just-added Reagan Mitchell will talk about issues like creating a feeling a safety for everyone, how to ensure accessibility for people with disabilities, and implicit structural biases in festival/conference bookers against women, people of color, people with disabilities, transgender people, and other groups. Check the panels schedule for more info. We also have some excellent workshops about subverting Google, bending with photoresistors, and making music with the Arduino. Seats are still available. Check the workshop schedule for more info. See you at 11:00 a.m.! It is with great pleasure that I introduce a new Theatre Intangible correspondent, Dylan Simon. Dylan will be writing the occasional article on music, concerts, life, etc. You can hear him on the podcasts Climax of the Dodo and The Swarm. For his first entry, Dylan writes about the somnambulistic effects of sound and also on improv duo 84001 (who can be heard on this T.I. artist showcase). Music is that of feeling. Sound is the vehicle which music inhabits. Life is the circumspect loop in which this all coalesces into an eternal manifestation of what we all know. The discreet and beautiful nature of the function of things is beguiling and shows the true omnipotence of love through communication and connection. With the polar action of breath we both bring in and send out that which functions as the essence of all. All is for all I do. There is a great moment when I am ceased and washed into a dimension of pure symbols, cleansed of physicality, notions of associations, assumptions and sense of duty. The moment is sound, so full as it encroaches my space and encloses my body in this place of visions through symbols. I can watch the unfurling of the collective experience between giver of sound and myself as observer. This sound must exist to show me something, yet I must break through so many barriers to truly see. The many associations of physicality provide so many questions as to how I fit into the greater collection of living beings experiencing “reality.” We speak to each other on many levels and I view the most potent of all does not use the contemporary concept of language. To truly speak there are many dimensions functioning. There are the words which are associations to already concrete concepts, nothing new can be experienced here, without using other functions as well (which is not prevalent in the greater society as a whole.) The words we use to “communicate” are created by sound, by breath, by personal frequencies. The sound under words is filtered and cataloged within the physiological system and multitudes of symbols are used to process the meaning, which in it’s true essence may or may not make it’s way to the conscious perception of what is being conveyed. The musical and artistic performance and the recorded sound have always resonated to me as another, higher function of communication. There are vast arrays of modes that can be tuned into the listener creating a total shift in consciousness. We all have music which lifts us or lowers us to the desired frequency which we would prefer to be vibrating at. Think back to those moments of despair, and the associated piece of sound or art which inverses your emotions to where you are unable to traverse alone. Through the sound and symbols an interactive communication takes place, but only once one attains true silence. Through the many associations which our perception of the world is built around, we our bound in an ocean of associations of associations. We are bound by masks of masks of what is being communicated to us. There are so many things to see, hear, touch, and taste which are connected with thoughts and ideas pertaining only to how they fit into the realm of physicality. Desires are bound by the ever-pulsating need for survival, acceptance of the tribe and one’s many needs being fulfilled. The essence of sound immediately goes to the unconscious center of a person and while in the ever expanding state of physicality, can only be accessed through dreams or more mere chance. Through meditation, pranayama, trance, prayer and other connection to the higher self or chosen concept of “god,” one can witness the true unfurling of what sound is bringing to you. I have been led to the point I have wished to make. I noticed something profound while “watching” a good friend of mine perform music live. His group 84001 create sound which I believe is intended to be perceived on an unconscious level, or that many boons are to be received when it is perceived as thus. I mean it as great compliment when I speak to my friend of the sleep that was induced while in audience to their performance. The walls of the physical world fell away, my head sunk down to a point of comfort and my breath slowed. The first time this happened I experienced a duality of pure ecstasy and shame in that I “missed” the performance. When taking stock of my experience I began having vague recollections of being on an organic highway encased within long, cylindrical portals being taken to a place of pure intention, of my friend’s pure emotional intention. I will note that I was not under the influence of entheogens, but the symbolism that I consciously witnessed, in that land of dreams was wholly of that realm of unconscious communication which I formerly spoke of. In the kind of music 84001 plays, which could be ambient, drone, beautiful atmospheric communications, or one of many other associations we place upon something so unsubstantial, I find it difficult to engage in the traditional performance setting. I wish to give an example which has no particular artist in mind, yet through it’s theoretical explanation, it shall sum up what I am trying to convey only through the use of language. When I see a band or performer play there is a formulaic grid which follows. There are the performers and the tools they use. There is the space which they play, and the space which they can be observed from. Most often there is an undeniable line between these two spaces, but not always. I will speak most specifically of the former grid. When the band or performer begins to play, the observer is is forced into a struggle of associations. Many things may come to mind, there is the ever-presence of other people in the room, moving, thinking, breathing, being. There are thoughts, curiosities, assumptions, mental notations. At least from my perspective the experience of a live performance can become so muddled by the multiple senses functioning and the physical and theoretical associations flooding the conscious-perceptive element of the mind. When it is a rock band, as long as they are all charismatic and talented players within their field, I most often do not have this issue, yet when it is a band like 84001, or other groups which I have experienced the SLEEP/DREAM environment (pelt, expo 70 are both quick examples), I feel the necessity to change the playing field. It is not up to me how the music is presented, and that is actually quite arbitrary, as it should be up to the observer how to finally process the sound being shared. First by accident in observing the unconscious journey I went on while sleeping during my friends set, I found that already with personal experience in meditation, this was by no means a shameful thing. I was not nodding off out of disinterest, but through an unconscious effort to truly feel and truly be of the essence of the music and sound being presented. I propose we all bring pillows and comfortable clothes to our friend’s performances, to let ourselves be washed away from all the physical and conscious associations and desires. To truly see the gift of communication that is being shared by those providing the sound and see more of ourselves with this simple and powerful gateway to all of the potential of the self.